Semillon is a thin-skinned white grape that ripens early. Semillon is used primarily in Bordeaux, France. It is the key ingredient in Sauternes. When drunk alone it has a grassy, "figgy" flavor, which can tend towards more of a nutty, floral flavor depending on the climate. Semillon is often blended with sauvignon blanc or chardonnay for added balance. As of 1998 there were 30,000 acres of Semillon planted in Bordeaux. Semillon is also grown in Australia and California, and while at one time it was the most planted white grape anywhere, it has fallen out of fashion. Semillon was brought to Australia in the early 1800s - it is currently well known there in the Hunter Valley. In general, semillon is a very easy vine to grow and is often used in new wine regions to test the soils and climate. Semillon can be drunk young for its fresher flavors, or allowed to age so the mellower flavors come through. It should be drunk within 5 years. It should be served at around 50F. It goes well with seafood and fish - from oysters, clams and scallops to salmon and tilapia. 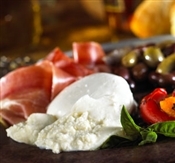 BelGioioso fresh mozzarella Burrata cheese is the centerpiece of a cheese plate and the perfect item for dipping. Wrapped in a layer of soft and supple mozzarella, the center of the ball is filled with a soft creamy filling. Mozzarella cheese suspended in thick cream makes the center of the ball perfect for dipping sweet or savory appetizers and for spreading onto muffins, bagels or other desserts. Add this sweet, rich cheese to sharper cheeses on top of fruit, crackers or cured meats to make a mouthwatering combination in every bite. Order one 8 oz. ball for your party or select a number of BelGioioso fresh mozzarella Burrata cheese balls to use in cooking. BelGioioso Burrata is made of Fresh Mozzarella Cheese filled with cream. 37-day shelf life. Special Order Items: When ordered by midnight on Thursday, will be available for shipping the following Monday. This item must not be in transit for more than one to two days. For those who prefer a milder, sweeter cheese, BelGioioso Fresh Mozzarella Burrata Cheese is the perfect addition to an entree, appetizer, hors d'oeuvres or desserts. Combining the award-winning BelGioioso Mozzarella recipe with a thick cream filling, the Fresh Mozzarella Burrata Cheese balls complete the ideal pairing of sweet and savory. With balls of soft, pure-white mozzarella cheese suspended in a milky cream filling, Mozzarella Burrata cheese makes a great dessert cheese or a delicious way to start a party. The cups, sealed to maintain freshness, include two 4oz. balls, so you can make double party trays or use in Mozzarella Burrata cheese in cooking. Special Order Sizes, when ordered by midnight on Thursday, will be available for shipment the following Monday. Burrata but not be in transit for more than one to two days in a chilled shipping container. BelGioioso Fresh Mozzarella Burrata Cheese uses the same exceptional mozzarella cheese recipe combined with rich, delicious cream. BelGioioso Fresh Mozzarella Burrata Cheese blends mozzarella cheese balls with a thick, white cream to make a flavor combination that is slightly sweet and savory. Soft and palatable, Mozzarella Burrata cheese may be used in many different dishes, from entrees with meat and vegetables to delectable desserts to appetizers. An outer layer of mozzarella holds in the cream and suspended mozzarella balls, making the perfect centerpiece for a cheese tray. Dip in crackers or fruits and combine with other cheeses to make a complete flavor combination that will satisfy cravings and impress your guests before the main course. Special order items, when ordered by midnight on Thursday, will be available for shipping the following Monday. This item must not be in transit for more than one to two days.